Jack Buckley was one of the most experienced air gunners in 617 Squadron, and one of only eight who flew on the Dams Raid already commissioned. Born in Bradford in 1919, he had joined the RAF at the outset of war. After training he first joined 225 Squadron, and then later 75 (New Zealand) Squadron, with whom he flew 35 operations, mainly with Plt Off Fisher. He was commissioned in June 1942, and then transferred to a training unit. He joined David Shannon’s crew in 617 Squadron in early April 1943, and became an important part of the squadron. Len Sumpter remembered him as owning a racing car, and also usually having a pint in his hand. 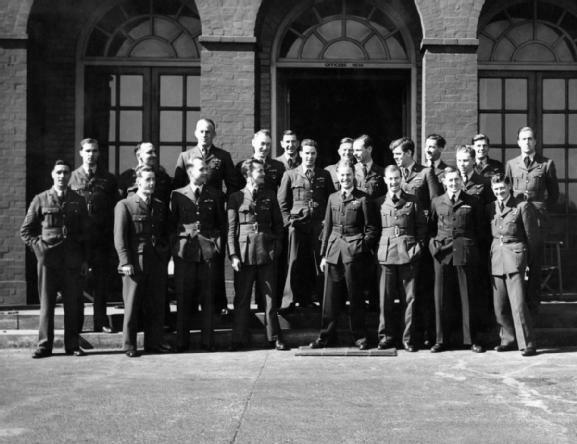 This reputation looks to have been cemented in the famous ‘morning after the Dams Raid’ picture, taken on the steps of the Scampton Officers’ Mess on 17 May 1943. Buckley is obviously laughing out loud – perhaps affected by a combination of quite a lot of booze and no sleep. He was awarded the DFC in July 1943 and flew on a number more operations with Shannon. In the summer of 1944, he went back to training and remained there to the end of the war. Jack Buckley died in Bradford in May 1990. Can anyone help corroborate some post-war life details for Jack Buckley after the war? I went to Worth Abbey School in Sussex and in my prep school years, believe it was Jack Buckley who was my music teacher. There was a rumour around the school that he had been on the Dambusters raid and when I saw his name and picture amongst those on the BBC website today, I was pleasantly surprised although I couldn’t recognise his picture. I guess he would have been at Worth Abbey from around 1969 (when I first arrived) for a few years; can’t say when he left, though the birth date above would make him 50 in 1969 – about right for the man I remember. My uncle knew Jack Buckley. I seem to recall in his later years Jack lived in retirement at Nab Wood near Bradford. Towards the end of his life he was admitted to the Cheshire Home at Calverley between Bradford and Leeds. Champion House it is called. He died early 90s. May 1990 will be right. It was reported in the local paper at the time. My uncle said he was a cheerful chap who enjoyed a pint. Never spoke much about his time in the RAF though. I knew Jack Buckley, I was an apprentice woolsorter with Messrs Cooper Triffit and Jack came to learn something about wool, it would have been about 1944/5. He had been invalided out of the RAF after a motor cycle accident. He was a pleasant chap. That will be it. If Jack was involved in the Bradford wool trade at some point after the war that will be how my uncle got to know him. Jack Buckley was a client of ours. We were insurance brokers in Bingley. My dad always asked him into our boardroom when we were dealing with his insurance. He was a good client and was held in high esteem by the directors and staff.